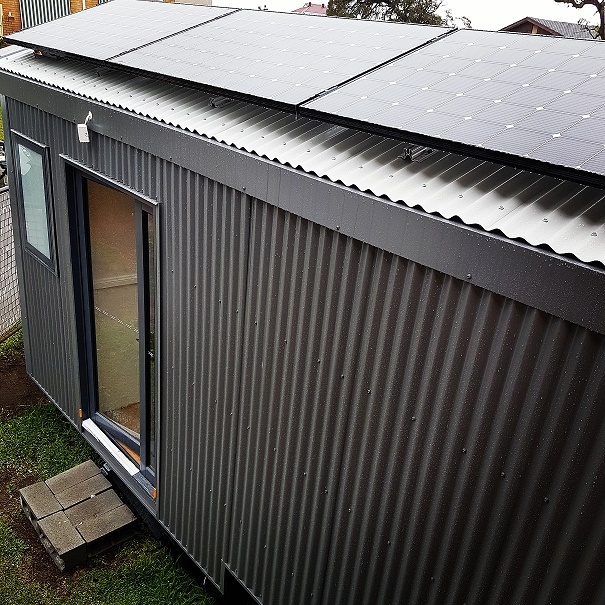 This article goes into detail about how the Joy Box tiny house has all the creature comforts of home, like a bathroom, laundry, air-conditioner and full-sized fridge, but is off-grid, fully powered by the sun. The Joy Box has a 3kW solar power system, including 4x165 AH battery storage (I mistakenly said 4x100amps in the vid!) What does this mean? It means she will not need to plug into the main electricity grid; she is self-sufficient and will draw her energy from the sun. I can hear you asking – but what about on cloudy days? The Joy Box tiny home has enough battery storage to run for about 4 days. 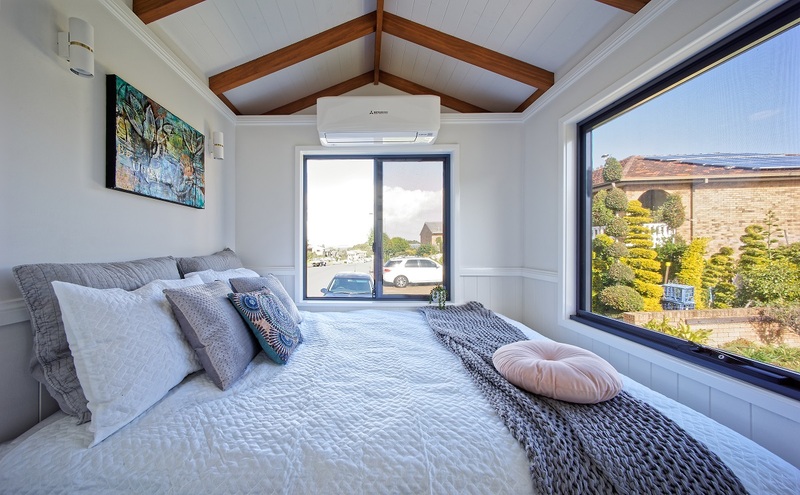 Yes – her owner will need to be conservative with power usage, like avoiding using the air-conditioner all day, to allow her to stay energised. It doesn’t use up precious water. Liquid (urine) is separated from solids (poop!) by closing a trap door. Depending on how many people use the toilet fulltime, you’d probably only need to empty it every 3-4 weeks. When you need to do a ‘Number-2’, open the trap door so it drops into a lined bucket. Separating the liquid from solids helps decomposition and minimises the smell. Again, I think you would only have to change this once a month or even longer. You can choose to add wood shavings to the solid waste as the Carbon from this helps to break down the solids and turn into a compost. Doing this will also mean you don’t have to empty it as much and will minimise any smell even further. If you don’t use woodchip, you can dispose of the waste which is collected in the biodegradable bag, which lines the bucket. A low-voltage fan pulls down emissions (smells) from the toilet, drawing it to the outside. This ensures there is little to no smell. NB: Your poop can be used as compost, but it’s not recommended for use on vegetation that you plan on eating. Typically, hot water can take up to 30% of your total energy usage. To minimise drawing on lots of the solar power, we have installed an instantaneous gas hot water heater. It is unhealthy for the environment to dispose of waste water on the ground (not to mention illegal). Water from the shower, washing machine and dirty dishes will be collected into a 110 Litre grey water tank. This will be located under the trailer. The Joy Box tiny home owner can connect a hose to dispose of the grey water at many, designated locations around the country. The tiny house roof is way too small to collect and provide enough water, for usage. We have installed two 90 Litre fresh water tanks under the trailer, which will be pumped up into the home when the tap is turned on. Some digital monitors will show when the grey water tank is full and the fresh water tanks need re-filling. Importantly, an off-grid system is environmentally sustainable, minimising our use of coal and emission of carbon dioxide into the Earth’s atmosphere. 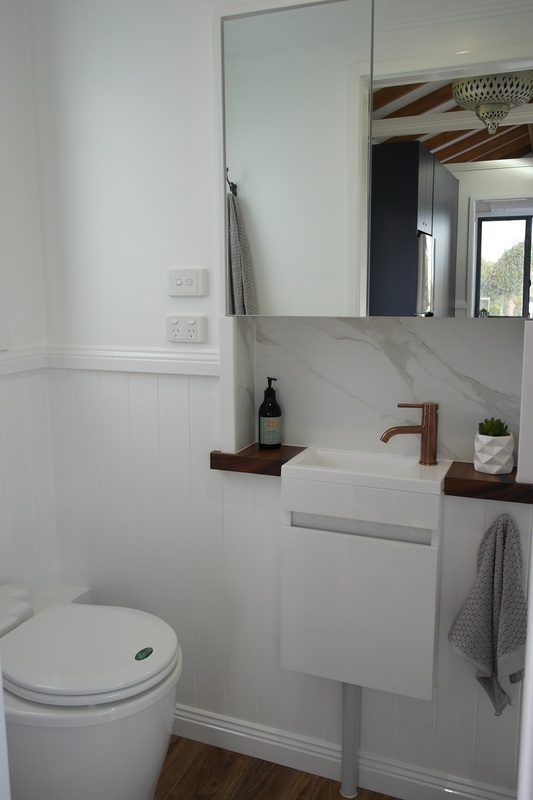 The compost toilet also reduces your impact on the environment as your – erm – personal waste is returned to the Earth as a nutrient, not a pollutant into our waterways. Over the long term, it’s cost effective. No power bills! It provides a flexible more freeing lifestyle – you can go live or holiday anywhere you like, because you are not reliant on connecting to the grid. Including all these systems in the Joy Box tiny home will ensure the owner can live comfortably as she would in any typical home. What’s next? Sign up to our newsletter so you don’t miss out on the next blog post about the clever storage solutions, including a sneak peak inside the almost-finished home! Those of you who love building and renovation would understand my obsession with watching the Joy Box tiny house being built. The floor and insulation are down, the framing is up, the structure is braced and the windows and door are in! Clay and the team are now working on dressing this gal with the Colorbond steel and timber cladding. In this article, we give some detail about the tiny house structure and how we’ve kept the design light, practical, and of course – beautiful! With a smart trailer design to save on weight, cost and building time, we didn’t have to lay floor joists. The ply was screwed and glued directly on to the trailer. We’ll choose a timber-look vinyl to finish the floor inside, so it’s easy to clean and looks great. We originally thought we’d be using a thick foam substance under the floor for insulation, but thanks to a wonderful local supplier, they put us onto Kingspan Air Cell. It’s Australian made and BCA (Building Code of Australia) compliant. It’s only 4 millimetres thick and functions as a 2-in-1 insulation and moisture management solution. It’s lighter, easier to install, and will last much longer because it has a unique anti-tear material – good for being exposed to rocks and debris on the road! Significantly lighter than timber, the steel frame is anchored to the foundations (the trailer!) using a bottom plate that is glue and bolted (M10). The frame itself has been assemble with rivets, screws and glue (my uncle has built cars and trucks his whole career and said to glue and screw everything!). The entire frame is braced with 1mm steel strapping; this stops the walls from moving in transit or in high winds. Also, within the structure is a steel rod that has been threaded on each side from top to bottom. This anchors the roof and structure to the foundations. To give the interior of the Joy Box a greater sense of spaciousness, there will not be a ceiling. Instead, we’re using timber framing because we’re exposing the beams and rafters. (So pretty!). Clay sourced clear pine; there are no knots in the timber, making it much stronger and oh-so beautiful. We have sacrificed on weight here for aesthetics, so we will have to “go light” elsewhere in the build to make sure she’s well under 3500kg! 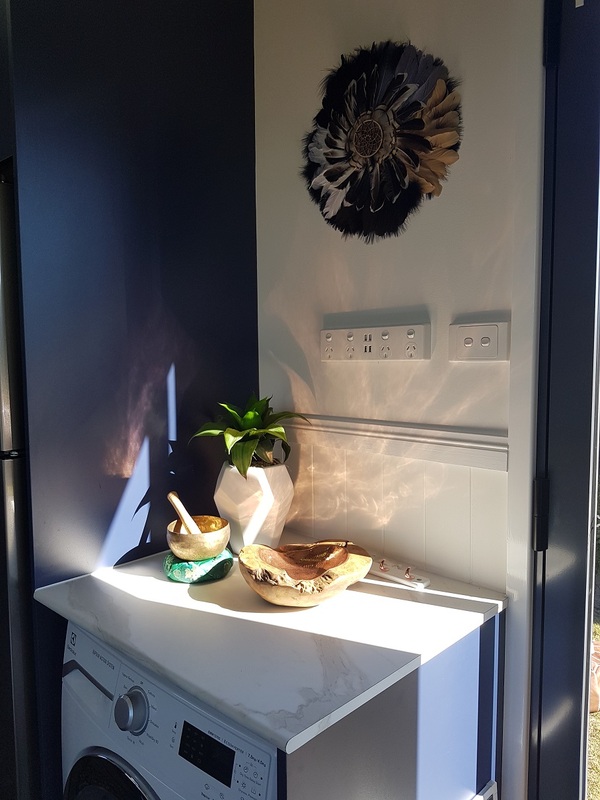 On top of the timber is painted, V-groove panelling – beautiful! Sign up for our newsletter so you don’t miss out on our next article that will go into detail about off-grid plumbing, solar and power storage. The Joy Box will function completely off grid! Click on the image below to view the image gallery to see our progress! An early image of Clay putting the first parts of the frame together. Floor plate and M10 bolt secures the frame to the “foundations”. Bracing the walls so they are square for installation of the roof structure. The Kingspan Air Cell under floor insulation is effective. Lots of hand crafted timbers for extra rigidity in the roof and so you can’t see the screws and joins. V-groove roof panelling with exposed timbers make this tiny home seem spacious and luxurious. Let there be light! A sky window will add extra light and sense of space in the kitchen. This article is all about the tiny house trailer design and the thought put into making it work for our client. Freedom and flexibility is what our client dreams of. She wants to be able to pack up her house, take it with her and hit the road to wherever its takes her. Using it like many do with caravans, our client plans to drive her house around rather stay put. Named by our client, the Joy Box will be large for its type, but light weight to ensure it’s legal and towable by a standard four-wheel drive vehicle. 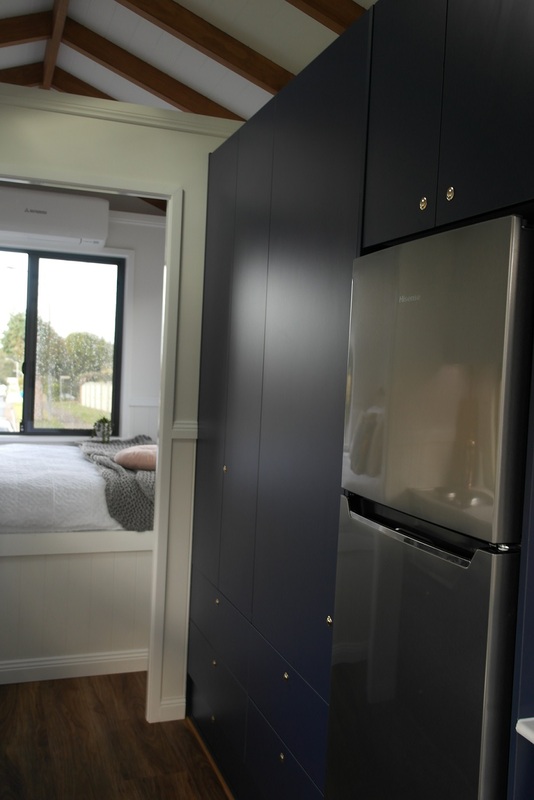 The Joy Box tiny house trailer is 7.2 metres long and 2.4 metres wide, not including the draw bar. In NSW Australia, the maximum width of a trailer is 2.5 metres. Our trailer width of 2.4 metres allows for the cladding, guttering and even external fixtures such as lights, to fit within the maximum allowable width. 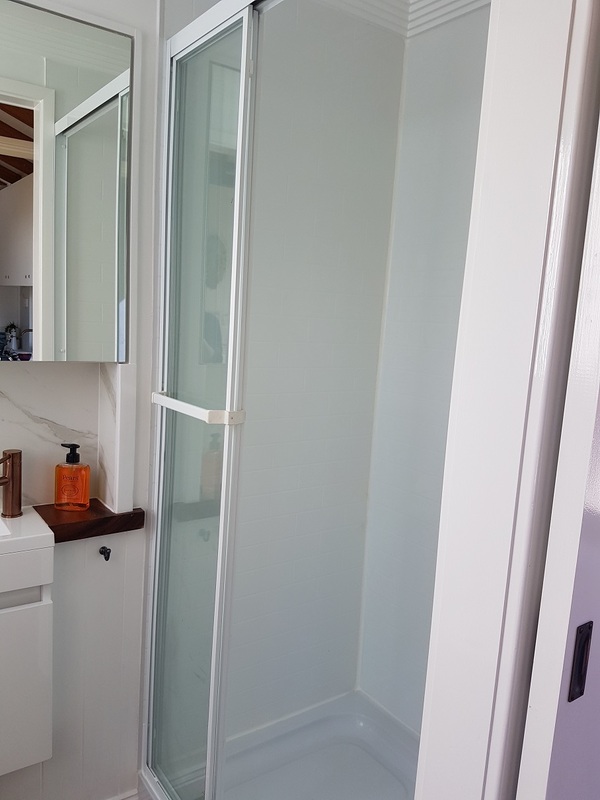 The trailer could be up to about 12 metres long, but while our client wanted a generously sized tiny house, it also needed to be light and easy enough to tow with a standard 4x4 vehicle. It has a flat deck with wheel arches, meaning the wheel hubs stick out. We opted for this design to minimise the overall height of the deck. While the wheel hubs take up floor space inside, we’ll shave off about 20-30cm in overall height, making it oh-so slightly more aerodynamic. is designed to drive on the highway, and the commercial truck wheels should last longer. If you Google tiny houses, you’ll likely see timber-clad beauties that exude quaintness and charm. They will also likely be from America, which has much more generous weight requirements than Australia. Timber is extremely heavy. A timber-clad tiny house of this size could weigh anywhere from 4.5 to 8 tonnes. 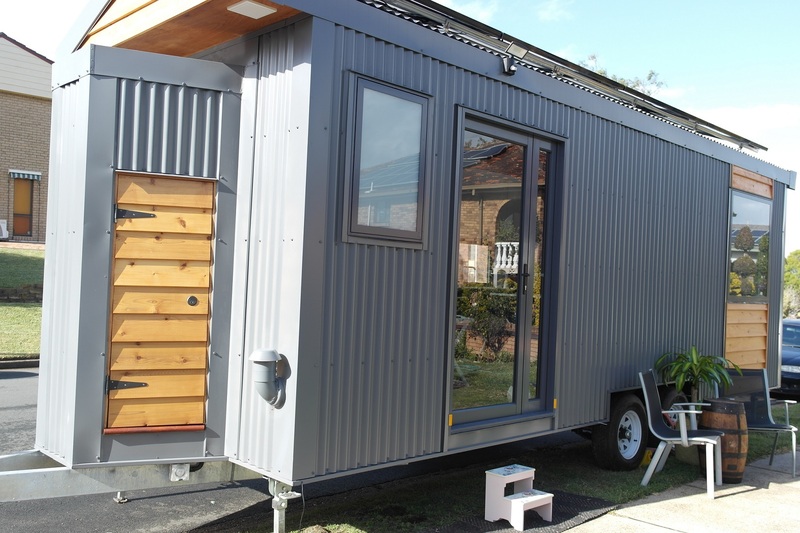 To tow it legally in NSW, the tiny house will need to weigh no more than 3.5 tonne. This is because most 4x4 vehicles available in Australia have a 3.5 tonne towing capacity. Anything above that would need to be towed by a truck (heavy vehicle). For this reason, the GVM rating of the trailer is 3500. Our client wants the freedom to hit the road with her tiny house whenever she pleases, so this was the defining factor in the overall design. It’s now registered and we’re already starting to the lay the floor and secure the house framing! But that’s for another instalment! Don’t miss out on the next update about the light-weight framing and cladding – sign up to our newsletter. The Joy Box, named by our client (and dear friend), is a tiny house on wheels. This tiny house will be eco-friendly with the ability to function on solar power and rain water (off-grid). It will also connect to main power and water supply when needed. She will be different to other tiny houses on the market in Australia and the USA. And these differences will make the build a challenge – but we’re up for it! Make sure to sign up to our newsletter to follow the journey of building the Joy Box with us! For a tiny house on wheels, Joy Box will be a big girl. At 7.2m x 2.4m, she will be compliant with New South Wales (NSW) road regulations. She will also be light weight. Most tiny houses of this size weigh about 4500kg up to 7000kg or heavier. Our aim is for her to weigh a maximum 3500kg. This is so she is towable by a robust four-wheel drive. Besides, if you’re driving on NSW roads, the maximum weight you’re allowed to tow behind an appropriate, “light vehicle”, is 4500kg. The total weight will include the trailer, tiny house, and all of our friend’s belongings. Our friend wants to use this tiny house as you would a caravan. She wants the freedom to hit the highway, with house in tow, to explore and experience life to the fullest. How will we meet these challenges? Please sign up to our newsletter (below) to find out our solutions! What’s included in the Joy Box tiny house? fun, adventure, and an affordable, environmentally sustainable way of living! How can all that fit into a 7.2x2.4m box? With careful design and clever building – but you’ll have to wait until a later post to learn about how we build it. This week has been a very exciting week for us, because we got to do the first inspections of the tiny house trailer. Watch the video for a sneak peak at the trailer so far. NEXT POST: Considerations for Our Tiny House Trailer Design. Subscribe to our newsletter so you don’t miss out on the next post!